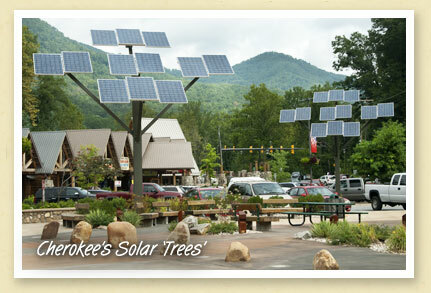 They make no shade, but the large ‘trees’ at Cherokee’s Riverbend Shopping area do provide a break from the summer heat… at least when you enter the town’s air conditioned Visitors Center. The new ‘solar panel trees’ generate all of the electricity used by the facility. It’s part of a tribal energy management project that has initially included retrofitting three buildings — the downtown Visitors Center, the Cherokee Welcome Center, and Boundary Tree restrooms — to make them more energy efficient. All three locations are also being fitted with solar thermal panels that will provide hot water for the facilities and new heating, ventilation and air conditioning systems. According to Damon Lambert, manager, Eastern Band of Cherokee Indians Building and Construction, energy efficient retrofitting projects are planned or underway at 24 tribal buildings. Seven of the projects will result in energy cost savings of at least 30% because of new HVAC systems, programmable thermostats, energy efficient lighting and other actions. All two dozen projects will pay for themselves in energy cost savings in just one to seven years.